Bowhunting World Editor-in-Chief Jace Bauserman experiences the Primos SurroundView 360 for the first time at the 2018 ATA Show. 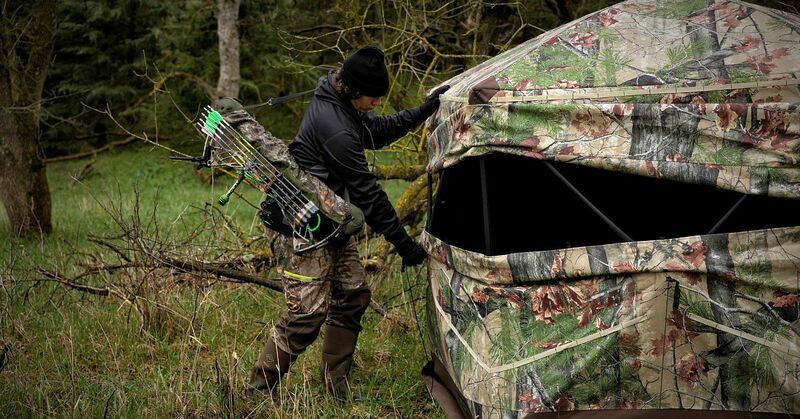 When it comes to introducing a beginner to deer or turkey hunting, nothing beats a ground blind. You can whisper back and forth, eat snacks without spooking game, and the walls and roof of the blind provide a bit of protection from nasty weather and even biting insects. Chances are good that you and your hunting buddies will soon be looking for a new ground blind to take into the field this fall during deer season. Here are 10 top new blinds to check out in person when visiting your local your archery shop. Perhaps the most unique blind to hit store shelves this year is the Double Bull SurroundView series ($300 to $500) from Primos (601-879-9323; www.primos.com). It features exclusive walls that are completely solid from the outside while offering a panoramic view from the inside. The SurroundView is available in 360, 270 and 180 models, which describes the degrees in which the see-through fabric is arranged. The 360 features four one-way, see-through walls and a movable blackout wall that can be placed anywhere inside, while the 270 offers this technology on three walls and the 180 on two walls. With dimensions of 60x60x70 inches tall, the SurroundView series, like all Double Bull blinds, features a patented hub system, is constructed with high-quality materials and offers a 180-degree shooting window. Ameristep’s (800-847-8269; www.ameristep.com) all-new Distorter ($300) ground blind utilizes kick-out technology to offer hunters a high-performance hub blind with next-level benefits both inside and out. On the outside, the kick-outs create a unique silhouette that blends into the environment more effectively than typical square blinds. With a footprint of 104x84 inches, a shooting width of 75 inches and the unique floor kick-outs, the Distorter can hold up to three hunters. The Distorter’s silent-hinge door eliminates noisy zippers, and the pair of kick-outs on the roof creates a 70-inch overall height that keeps your bow from touching the top of the blind during the draw. Other features include several large windows with silent covers and mesh attachments, sewn-in corner shelves, a carrying case that doubles as a hanging storage system and heavy 300D fabric shell construction. Designed specifically with the bowhunter in mind, the new Mantis series of blinds from NAP (800-323-1279; www.newarchery.com) is certainly something to consider this season. There are two-hub ($200) and three-hub ($300) styles from which to choose. Both feature an asymmetrical design that is taller in the front so your bow won’t brush the blind when releasing an arrow. The Mantis is incredibly easy to set up and weighs considerably less than a typical five-hub blind, and it features a strong, rip-resistant 600-denier Oxford Weave fabric. Because the camo pattern is applied as a wet print instead of the typical heat-transfer method, you won’t see those awful reddish and pink color changes after a season of use. The Mantis’ DragNet window system is silent and infinitely adjustable, and the new Wicked Intent camo pattern uses 14 natural earth tones to match the woods around you. The Mantis 2 features a 38-square-foot floor space and is 5 feet 9 inches tall, while the Mantis 3 offers 48 square feet of floor space and is just over 6 feet tall. Whether you prefer to sit or stand when shooting, the Powerhouse Edge ($250) from Browning (800-344-2755; www.browningcamping.com) is a blind worth considering. With a center height of 6 feet 10 inches and a shooting width of 74 inches, the Powerhouse will easily accommodate most hunters. Other features include a panoramic Silent-Trac window system that offers easy adjustment and a 180-degree shooting window, durable oversized #10 zippers, two camera window ports, a bow hanger, gear pockets and durable 600-denier polyester fabric construction with blacked-out backing. Lastly, the full-length door offers silent and easy access, and with Realtree’s new Edge pattern you’re sure to disappear. With reinforced stress points and an oversized carrying bag, the new 2X-P ($390) blind from Rhino (440-281-8300; www.rhinoblinds.com) will turn heads this year. Utilizing Predator’s All Purpose Deception camo pattern, the 2X-P is constructed from a UV-protected 600-denier polyester fabric that is both water-repellent and mold-resistant. The shoot through netting is attached with a hook-and-loop system instead of noisy Velcro. The 2X-P measures 7 feet 4 inches from hub to hub and has a center height of 6 feet 6 inches, so there is plenty of room to stretch out for those long hunts. Introduced last fall, Redneck’s (877-523-9986; www.redneckblinds.com) Ghillie Deluxe ($600) not only offers a roomy 6-foot by 6-foot footprint and is nearly 6.5-feet tall, but its water-resistant 600-denier outer ghillie cover virtually disappears in brushy areas. Its strong, powder-coated, tubular steel frame easily handles high winds and heavy snow loads, and, at 133 pounds, the Ghillie Deluxe is ideal for leaving up all season. The one 10x18-inch, four 10x46-inch vertical windows and three 14x30-inch horizontal windows have a double zipper design that bowhunters can choose to open or use the see-through mesh that will easily slide out of the way when shooting. Lastly, the 64x32-inch door is wheelchair-accessible, and the blind’s frame includes a convenient bow hanger. With a compact design of only 60x60 inches, the new Ox 4 ($250) from Barronett (800-345-6007; www.barronettblinds.com) is constructed from a premium OxHide fabric that features a unique two-layer bonded system which maximizes concealment on the exterior with a soft, no-shine, rich camouflage layer permanently bonded to an ultra-durable, waterproof, woven polyester interior layer. Although this process adds overall weight to the blind, which weighs just shy of 30 pounds, it adds a level of durability that will last for seasons. This hub-style blind also features the Ninja Adaptable Window system that provides full — and silent — adjustability, a full 180-degree shooting window and brush holders for concealment. Today’s box-style blinds are built better than ever, and nowhere is this more accurate than with the Bull Blind ($2,500) from Muddy Outdoors (844-745-7723; www.gomuddy.com). Boasting heavy-duty construction, the Bull Blind has an octagon shape and features three-layer Thermatech wall panels that have an R-7 insulation rating and sealed construction to minimize scent escape, deaden unwanted noise and keep cold north winds at bay. The roof is constructed from a rotational-molded plastic, so you can rest assured heavy snow or rain won’t be an issue either. Residential-quality glass, gasket lining and steel hardware allow the windows to be opened in silence, and with both horizontal and vertical window configurations you’ll have 360-degree viewing with ample shot opportunities. The Bull Blind Combo ($3,000) includes a 10-foot tower that is constructed from a heavy-duty, powder-coated steel and a non-slip powder-coated ladder. If roominess and easy access are what you need, then look no further than the Mohican ($340) from Native (614-409-9300; www.nativegroundblinds.com). With a center height of nearly 77 inches, a footprint measuring 67.5 x 67.5 inches and a garage-door-style entrance that swings the whole back panel open for easy access, you can see how the Mohican is ideal for the bowhunter looking to take kids along for the adventure. Some of the other features include magnetic closures and a slide window system for silent operation, brush holders to help with concealment and 600D rugged fabric. The Mohican weighs just under 18 pounds. Because filming hunts have become more popular in recent years, Xenek (406-239-3288; www.huntxenek.com) is meeting that need with the Apex ($400) blind. The unique tripod slots allow hunters to pass a tripod leg through the wall. This not only allows the camera to be situated closer to the window for a greater field of view, but it also creates more room in the blind. Other features include 10 built-in accessory mounts, greater window configurations and a patent-pending hub-coupling system to provide the hunter greater ability to customize their blind with various attachments. Measuring 72 inches and offering a height of 73 inches, the Apex is constructed from a durable 600-denier polyester fabric with reinforced corners and offers an outer shell in the popular KUIU Verde camouflage pattern. The GhostBlind (740-374-6766; www.ghostblind.com) is perhaps the most unique portable blind a bowhunter can use, and it is very effective. Using the reflection of a mirror to blend in seamlessly to whatever type of cover is around you, the Predator ($200) is designed specifically for the bowhunter. Developed from a durable waterproof plastic, the Predator has four reflective panels that fold up for easy transport; between each panel are shooting ports that allow you to stay concealed while drawing. Because the panels have a slight angle toward the ground, sun glare is not an issue either. The Predator stands 46 inches tall, is 102 inches wide, weighs just 12 pounds, and comes with a carrying strap and stakes.